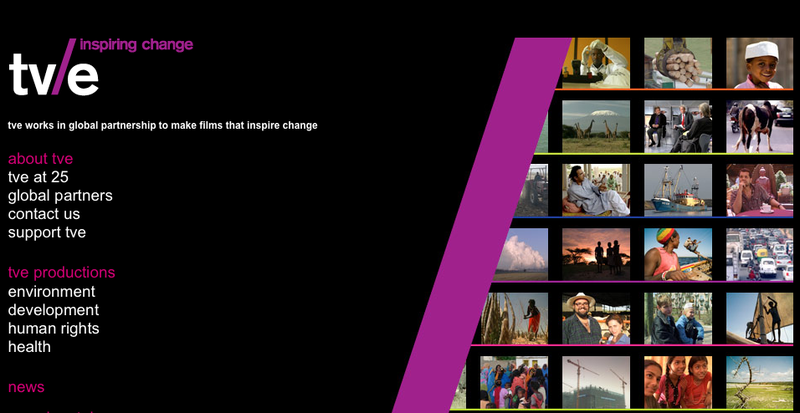 Today PUMA.Creative and Channel 4 BRITDOC Foundation announced the launch of the PUMA.Creative Impact Award, a major new annual award to honour the documentary film creating the most significant impact in the world. This 50,000 Euro award acknowledges the film's makers and will help the continuation of the film's campaign work. The PUMA.Creative Impact Award will be selected by a jury which includes Her Majesty Queen Noor of Jordan; Morgan Spurlock, Academy Award-nominated Director of Super Size Me; Orlando Bagwell, Director of the Ford Foundation Social Justice Media Initiative; and Emmanuel Jal, musician and activist. "Finally, an award which acknowledges the unique role documentary film plays in society," said Morgan Spurlock. "I am proud to be invited to join the first jury and I encourage documentary filmmakers everywhere to take a look at this initiative. It is really going to make a difference." 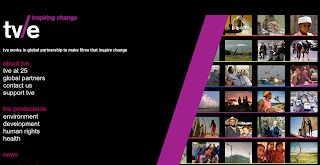 "With a financial reward that encourages best practice in the filmmaking community, the aim of the PUMA.Creative Impact Award is to draw attention to the finest creative, social justice, peace and environmental filmmaking in the world," said Jess Search, CEO, Channel 4 BRITDOC Foundation. Recent high profile releases such The Cove, Food Inc, Burma VJ, No Impact Man and The Age of Stupid will all be eligible to compete for the prize money as well as less well-known films that have had a large local effect. "As individuals and as organisations, we are faced with some serious challenges today such as ongoing conflict, climate change, loss of biodiversity. None of these issues will solve themselves without intervention," says Jochen Zeitz, Chairman and CEO of PUMA. "We, at PUMA, have chosen to intervene through film because it is the most powerful medium to reach mass audiences and influence opinion formers and will contribute to leaving a better world for generations to come." The call for the PUMA.Creative Impact Award opens on January 21 during the Sundance Film Festival. Anyone can put a film forward from any country - filmmakers, distributors, film festivals, partner organisations including NGOs and Foundations, film critics and journalists. 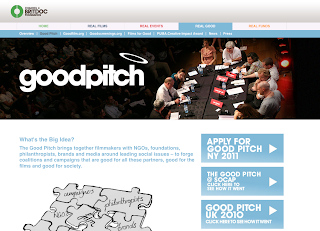 Each filmmaking team must submit data demonstrating evidence of the film's social impact and if shortlisted additional data and verifications will be requested. Films can be put forward any time up to three years after release (where the release is defined as first film festival screening, TV broadcast, cinema release or internet release). Submissions close on April 1, 2011 when Channel 4 BRITDOC Foundation will assess applications and produce a shortlist to be assessed by an international Peer Review Committee including: Carol Cone, Executive Vice President of Cone@Edelman; Diana Barrett, President and Founder of Fledgling Fund; Yvette Alberdingkthijm, Executive Director of WITNESS; Pat Aufderheide, Director of Center for Social Media, American University; Isabelle Schwarz, Head of Strategic Programmes at European Cultural Foundation; Heidi Gronauer, Director of ZeLIG school for documentary, television and new media and EsoDoc; Sarah Hunter, Head of UK Public Policy at Google; Sally Ann Wilson, Secretary-General at Commonwealth Broadcasting Association; Isabel Arrate, Fund Manager at the Jan Vrijman Fund; and Karolina Lidin, Documentary Consultant at the Nordisk Film & TV Fond and Sheffield Doc/Fest. "Music is one of the few things that has the power to touch your heart mind and soul without your permission. This is why I choose to use this tool to pass my message to the world," said says Juror Emmanuel Jal. "Film has the same power, moving pictures can tap into the senses, pull on the heart strings and communicate intense and detailed information to the viewer." Filmmakers interested in applying for the PUMA.Creative Impact Award should go to www.britdoc.org/impactaward. 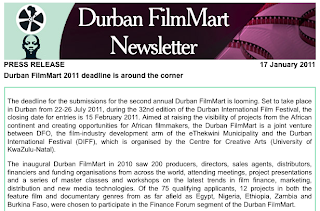 The deadline for the submissions for the second annual Durban FilmMart is looming. 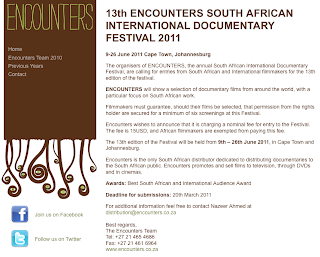 Set to take place in Durban from 22-26 July 2011, during the 32nd edition of the Durban International Film Festival, the closing date for entries is 15 February 2011. 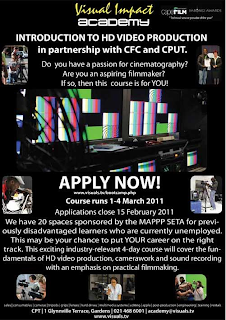 Aimed at raising the visibility of projects from the African continent and creating opportunities for African filmmakers, the Durban FilmMart is a joint venture between DFO, the film-industry development arm of the eThekwini Municipality and the Durban International Festival (DIFF), which is organised by the Centre for Creative Arts (University of KwaZulu-Natal). The inaugural Durban FilmMart in 2010 saw 200 producers, directors, sales agents, distributors, financiers and funding organisations from across the world, attending meetings, project presentations and a series of master classes and workshops on the latest trends in film finance, marketing, distribution and new media technologies. Of the 75 qualifying applicants, 12 projects in both the feature film and documentary genres from as far afield as Egypt, Nigeria, Ethiopia, Zambia and Burkina Faso, were chosen to participate in the Finance Forum segment of the Durban FilmMart. Too many re-runs of old movies, such as those starring the actor Sylvester Stallone, are costing the SABC its television audience, parliament's communications portfolio committee has heard. In the first of 14 interviews aimed at selecting four new members for the national broadcaster's board, business administrator Sethe Makhesha told MPs on Tuesday that while the SABC had made a "lot of effort" with regard to local content, the international film fare it served left a lot to be desired. "The kind of material that we need to be buying... internationally should be the latest, the [most] recent. "Because with the low quality that we are currently experiencing -- I mean, for example, we have Sylvester Stallone movies being featured on Friday night, something we used to have in 1985 -- I don't think that is attracting a good target audience." Audiences were switching to satellite channels because they wanted to see recently made films, she said. 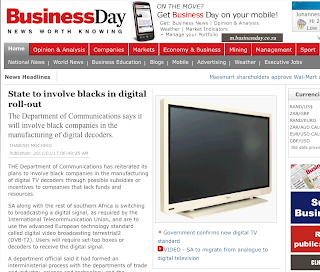 THE Department of Communications has reiterated its plans to involve black companies in the manufacturing of digital TV decoders through possible subsidies or incentives to companies that lack funds and resources. SA along with the rest of southern Africa is switching to broadcasting a digital signal, as required by the International Telecommunication Union, and are to use the advanced European technology standard called digital video broadcasting terrestrial2 (DVB-T2). Users will require set-top boxes or decoders to receive the digital signal. A department official said it had formed an interministerial process with the departments of trade and industry, science and technology and the Treasury to seek ways to help small black manufacturing companies become involved in the manufacturing process, possibly by incentives or through financial aid. 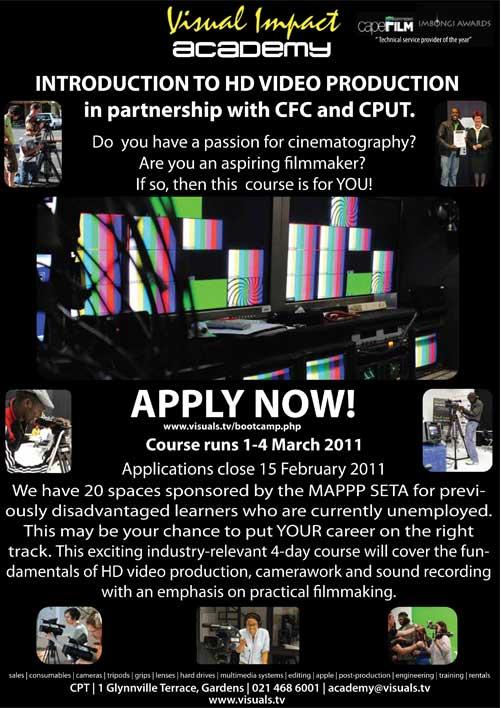 The South African feature film industry appears to have reached a tipping point over the past year, which is indicated by the tripling of entries in this category for consideration in the annual South African Film and Television Awards (which take place in February each year) from six in 2009 to eighteen in 2010. This increase in the number of films eligible for nomination is a direct result of the unprecedented increase in the number of films being produced in the country considering that not all feature films submit applications for nomination. The reasons for this increase are two-fold. By Clarence Hamilton. On the one hand the impact of the continuing crisis at the public service broadcaster, (annually responsible for commissioning approximately R1 billion in independent original programming), can be considered a major factor. 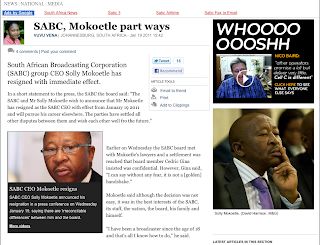 The financial woes at the South African Broadcasting Corporation (SABC) resulted in a steep decline in such commissions, the loss of hundreds of jobs and the closing down of production companies. The surviving companies have increasingly had to turn towards feature film development and production as well as non-commissioned documentary development and production. 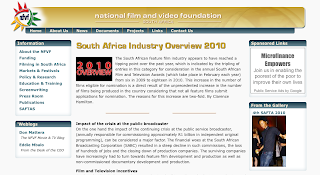 On the other hand, the amendments to the South African Film and Television Production and Co-production Incentive and the Location Film and Television Production Incentive and their efficient administration by the Department of Trade and Industry (Dti) have resulted in a massive stimulus to economic activity in the sector. This is demonstrated by a decrease in the ratio of provisional certificates issued against the number of productions which confirmed commencement of principal photography and or claimed from the incentive. In the 2009/2010 financial year as many as a third of projects granted provisional certificates failed to confirm commencement of principal photography or claim against the rebate. So, in spite of the gloom surrounding the SABC, feature film production, which has been stuck at around nine films per annum for almost a decade, doubled in one single year. To read the rest, visit the NFVF's site.